After three years of successful runway modeling for top labels like Marc Jacobs, Lanvin, and Yves Saint Laurent, Karolin Wolter was tired of rigid diets and self-loathing in front of the mirror, so she made a risky decision. She became a plus-size model. This is her story, written in her own words. I started modeling in August, 2008, by sending snapshots to some agencies in Hamburg. I met with all of them and decided to go with m4 models. (A very good decision, I can safely say now!) Two months later I moved to New York. I've experienced so many amazing things during my time in New York. I've known joy and happiness, and crushing pain as well. While I wouldn't give up these memories, and the many things I've learned, I would never want to go through these years again. 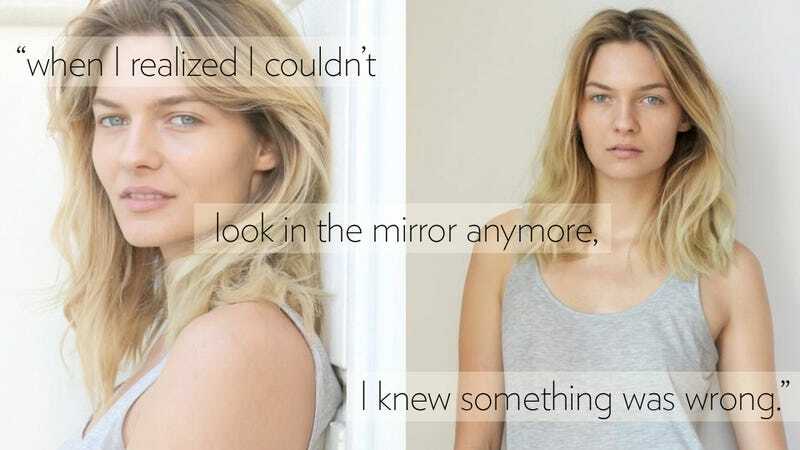 Working in an industry that constantly judges you, your look, and your body isn't easy. Especially for someone like me, who was never skinny enough. I'm 181 cm (5'11") tall. Before getting into modeling I was 62kg (136 lbs), a normal weight for a girl, and rather slim for an average non-fashion person. I was 57kg (125 lbs) when I first got into fashion modeling. At that time I still felt fat, people were telling me I had to lose weight. Now, when I look at my very first set of Polaroids I can't believe how good I looked. Worse, I can't believe I seriously thought I was FAT. During my first fashion week in February 2009 I was 53-55kg (116-121 lbs) — almost 10kg (22 lbs) under my natural body weight. I did well, I did really well, but even then my agents were telling me, "You know Karolin, next season are the spring/summer shows, you have to be even skinnier." At the time I honestly thought it was totally fine to weigh less than 55 kg (121 lbs). Now, while writing this, I am shaking my head, I can't quite believe it. In those days I rarely, if ever, had the feeling that anyone in the industry actually thought I was perfect the way I was. I am not surprised it completely fucked with my mind. My natural eating behavior disappeared entirely. I didn't know if I was hungry or what I was hungry for. Every time I looked in the mirror I had this feeling of not being the way I was supposed to be. Every day the burden became heavier. Work became exhausting, I was afraid of disappointing the client. For some reason it usually went well on set, not always, but most of the time. The actual struggle was when I wasn't at work. At home, before a big job, I was absolutely useless because of the unbelievable mental pressure. In the beginning of 2011 I quit. I didn't have a choice. It was very hard to turn down numerous jobs and therefore lose money, but when I realized I couldn't look in the mirror anymore, I knew something was wrong. I decided to go back to Europe for a couple of months to go hiking in the Alps alone. This was something I always wanted to do and I was glad I did. In fact, I hope I'm able to find time to make this a yearly trip. I also decided to spend more time in Europe in general. I got an apartment in Berlin which has been a good experience. At the end of 2011 I said to my agents, "You know what, I think I'm ready to work again, under one condition: You have to put my real measurements on my card." To my surprise, they agreed. Then I said to my agent in New York, "Maybe I could be a plus-size model?" "No way, you are not big enough," he said, but I didn't give up. A few months later, we all realized that this hadn't been the best idea. I hardly got any work, and when I did, I needed to wear pads to make me look bigger. Suddenly, I was too slim. On top of that, The Cut, the online version of New York magazine, wrote a few lines about me being plus-size. After being picked up by the fashion blogs, it was the first thing to pop up when "Karolin Wolter" was Googled. That's why my agents in Europe were having trouble booking me, because everyone thought I was big. My German agent made me take new Polaroids every week, but many clients thought the photos weren't real. Ironically, as of a few days ago, I am a straight-size model in New York again, back with my old crew at the Ford high fashion board. I am thrilled about this change. At the same time, I am also saddened by it. I was proud — I actually loved being called plus-size. I told everyone I was plus-size. I love the words "plus-size." To be given this label was most likely the happiest day I can remember. The funny thing is, the day that it happened, I instantly lost about 2 kg (5 lbs). The pressure was gone, and my natural eating behavior came back. I have no clue what is going to happen with me in the fashion industry. I am no longer pressuring myself, I try to go with the flow while keeping my priorities straight. These days I enjoy working with smaller clients, or even shooting just for fun with photographer friends. Even then, I have earned more in the last three months then ever before. There just isn't any rule. It's not about how big you are, how small you are or what label you are given. It's about how you carry yourself. If you are comfortable with your body you can sell pretty much anything. This post originally appeared [link somewhat NSFW] in I Love You magazine. Republished with permission.